This time I had no specific reason why I wanted to visit Baba – we had a few days of Eid holidays in Oman, and I simply wanted to use that opportunity to have his Darshan and express my gratitude for all the life-transformative blessings (the biggest one being Mohanji’s presence in my life) that he showered me with since 2006 when I first met him (in this life). I had no idea just how crowded Puttaparthy would be days before Baba’s birthday celebrations – I assumed that, as always, I could get a small hotel room at a walking distance from the Darshan hall. Interestingly enough, when I accompanied Mohanji for a weekend trip to Dubai and BTW meditation on Nov 5th, I entered into a casual conversation with a sweet lady called Anitha who attended the meditation. During our bubbly post-meditation chatting, I mentioned my intention to visit Baba for a few days. To my great surprise, she instantly offered me to stay in her apartment, which is at a walking distance from Baba and happens to be empty during those days. I was overjoyed and deeply touched – not because I will get to save some money, but because I understood this was Baba’s loving invitation, his way of saying that I am welcome. My joy knew no bounds two days later, when I found out that, due to the high demand, hotel rooms are no longer available, except at a 5 times higher price and a down payment for a minimum of one week. Agh, what an amazing Master! 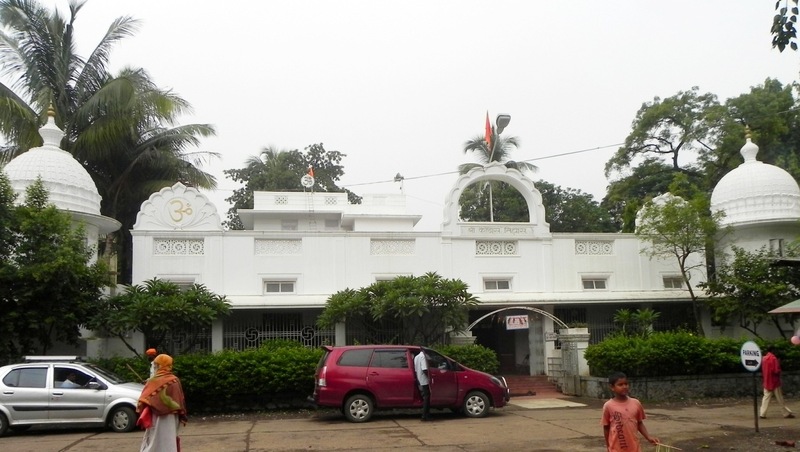 Moreover, during my short stay in Baba’s abode, I gained one deep insight about Seva – through other people, and several situations I experienced in Puttaparthy: when people approach us for help at the time of great need (which often only their heart knows – just like in my situation with the Museum), that is the time when a real Seva opportunity presents itself to us, the time our spirituality is truly tested… It is then that we should give spontaneously, without hesitation, give fully from the heart – for it is during those precious moments that we receive really big blessings from the recipient’s side; those are the golden moments when many of our karmas are being deleted. I experienced that kind of blessing from an old man who was begging on the road this time in Puttaparthy – I was in a hurry and just passed him by. But then, something deep within me rebelled as I simply couldn’t go eat my breakfast knowing he would remain hungry. I returned, walking fast to catch up with him, tapped him on the shoulder, and gave him 10 rupees. And what an amazing toothless smile he gave me – I never expected that such great excitement, great joy would emerge from his being!!! He kept blessing me as I continued walking towards the restaurant, floating in bliss. 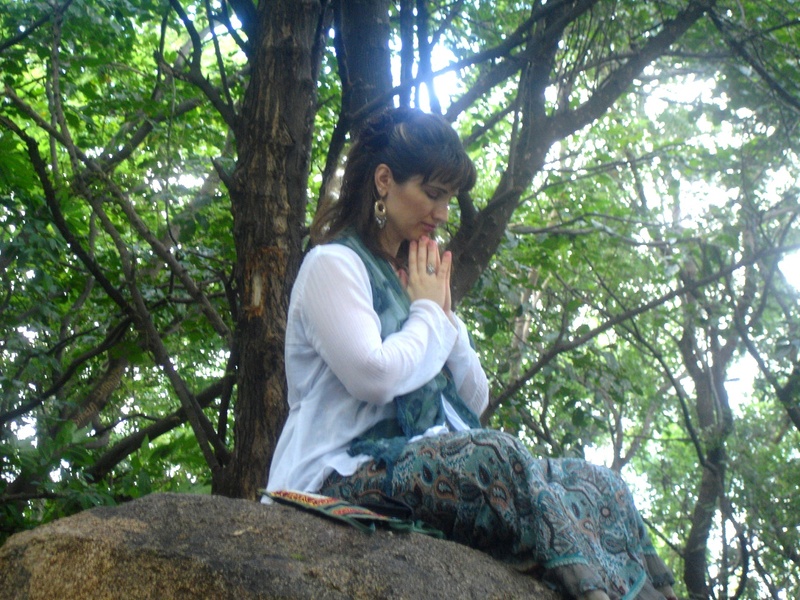 Indeed, there are times when we decide to do Seva but the intensity at the side of the recipient may not be there fully… We should be attentive/aware enough to recognize those moments in our daily life and give spontaneously, from the heart… – for it is nothing but Divine in us that is expanding in Love while connecting with the Divine in the other being. Love all, Serve all! Aum Sri Sai Ram. Everything happens at the deserving level - even a cure! Over the previous few years, my health condition (which used to be excellent for more than 50 years) deteriorated due to symptoms of benign prostatic hyperplasia, which was exacerbated by the effects of severe insomnia. 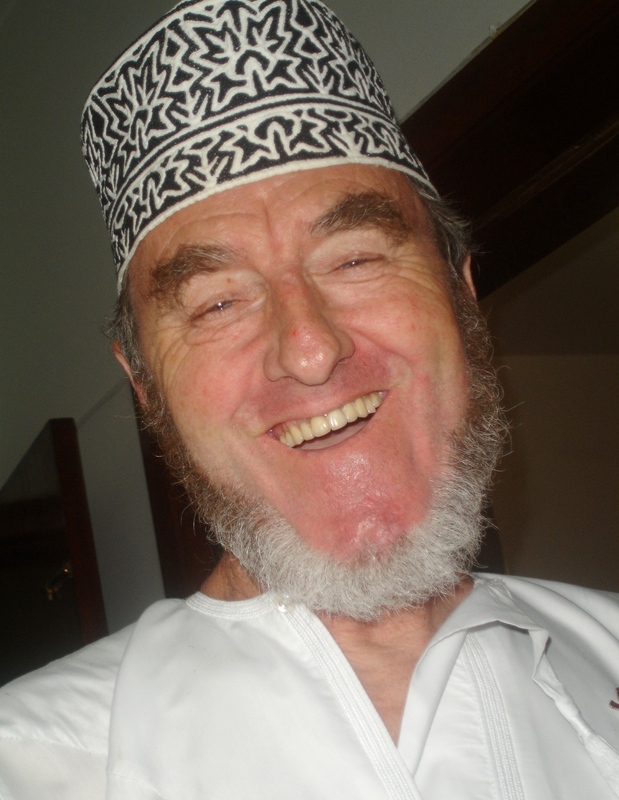 Ramadan fasting during Sept, 2009 triggered enhanced symptoms of prostatic hyperplasia which completely affected my sleep patterns and personality – It became impossible to sleep at night, with the constant urges to urinate. This made me very irritable as my life turned into a nightmare. The situation reached a peak in November, 2009 and I was forced to undergo a transurethral operation which reduced the size of the prostate by 53 grams. However, the symptoms continued and the continuing insomnia also produced short term memory problems, dizziness, irritability, nausea and antisocial feelings which changed my personality and markedly reduced my effectiveness as an English teacher. During that winter from Hell I tried all kinds of drugs from salt laden antidepressants to prostate sustainers and valium, but none of them worked. By my birthday in June, 2010, there was still no sleep, and I felt I was literally dying from the cumulative effects of months of insomnia and prostatic hyperplasia which did not seem to be improving. I was slowly slipping in consciousness, become even more antisocial and did not even want to drive anywhere. My wife Jessie was most affected and insisted that we camp out at SQU hospital and get an appointment with the sleep doctors. Auspicious coincidence brought Dr.Deepali and I together on July 22, 2010. 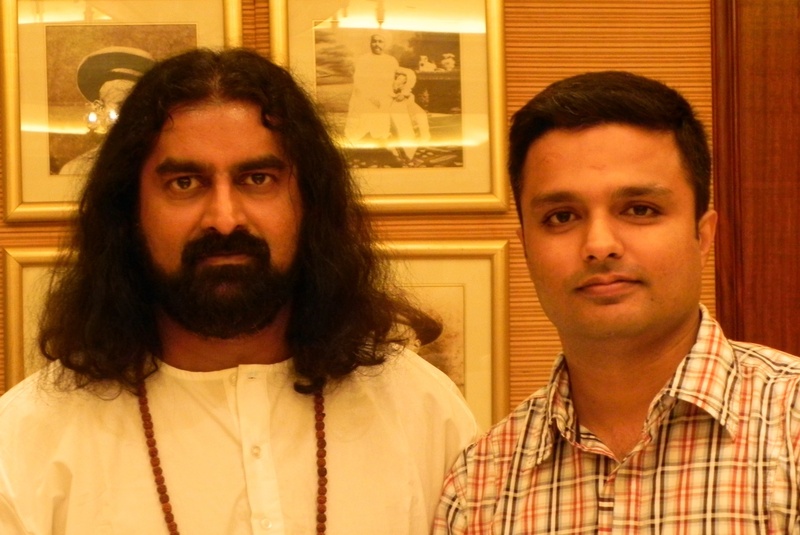 On July 25th, I did my first Power of Purity meditative breathing with Dr.Deepali, as per the guidance of Mohanji. She explained the breathing process and then played the Power of Purity meditation CD. I don’t know what happened but I cried for over 1 hour during the entire session and felt relieved and grateful after this session. I requested a copy of the CD and zealously did the prescribed breathing and Power of Purity meditation every night after that. On July 27th I had my sleep lab sensors test which indicated over 20 sleep apneas per hour. I went on the CPAP machine on Aug 1st. With CPAP some kind of sleep returned but I struggled with the mask which caused me physical pain. However, every night before sleeping I listened to the CD and the stress of accumulated insomnia started to dissipate. Next highlight was my actual meeting with Mohanji at his residence in Muscat. 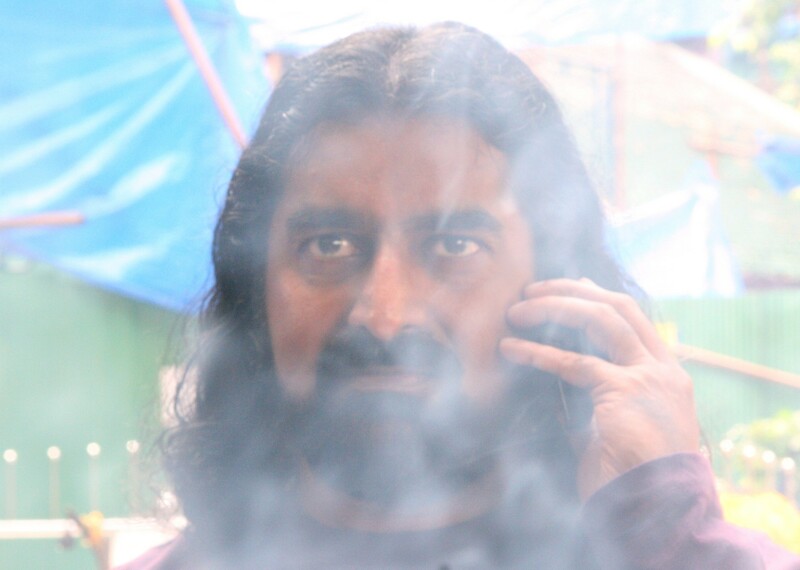 Again, I don’t know (logically) what happened, but after that I did not seem to need the CPAP machine as much and with the meditation practice and connecting directly to Mohanji eyes (and the ancient lineage of Masters he connects with), the sleep apnea just stopped!!! That is a miracle I most definitely attribute to connecting to the wisdom of this meditation and, through Dr. Deepali, to Mohanji. I went off the CPAP machine on Sept 20th and returned it to the hospital on Oct 11th. I also bought a new thick mattress, as per doctor’s advice, and now sleep about 5 hours of natural sleep every night, which, to me, is an unimaginable blessing. 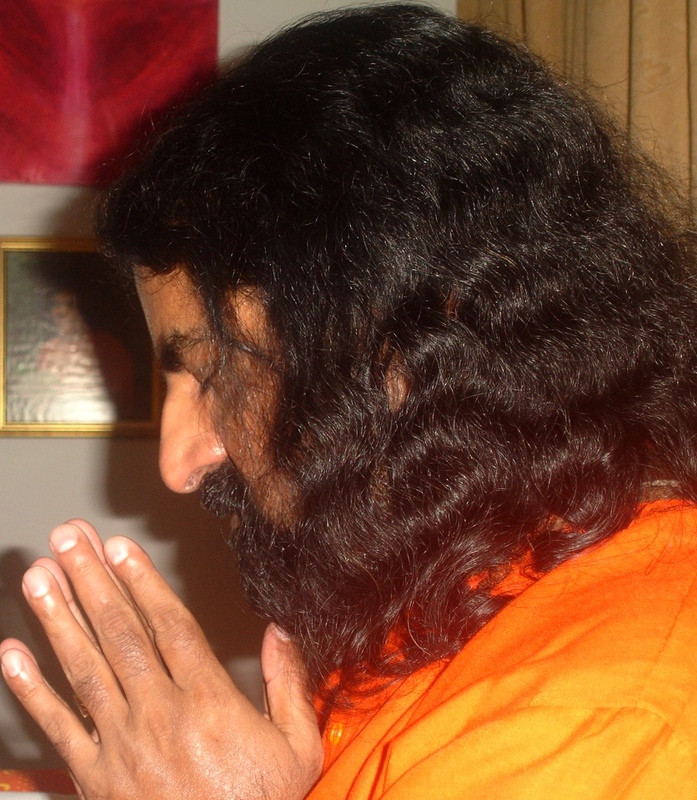 I continue to religiously do the meditative breathing and Power of Purity meditation to honor the connection of the ancient wisdom which reached us through Mohanji. Today my meditative experiences include leaving my body and traveling away while my body remains in a state of complete calm and resting. I also get zapped in my third eye by Mohanji, which is a wonderful experience. In one such instance, I had a vision as to how to help my 38-year-old son( who lives in Holland with his wife), to get rid of the anger he took on and carries as a ten year old son of divorced parents who underwent a very painful divorce and had to stay loyal to his mother. Now that I am sleeping 5 hours a night, my bubbly social personality has returned, as has my control over water out functions. When the student is ready, the teacher appears – this is my experience as I am presently able to sleep and function without any drugs whatsoever. Praise be to Mohanji, ancient energies and wisdom for that! 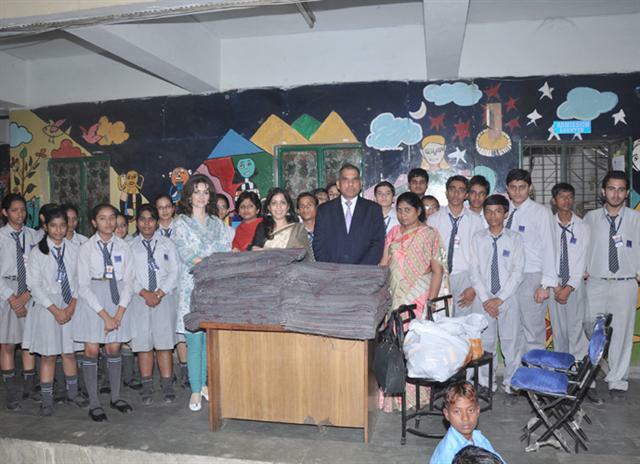 Blanket Distribution 2010 in Delhi – on Ammucare Day! How blessed we were to be a part of ACT’s team of volunteers on exactly on the Ammucare Day – 9th of November 2010. This is only a beginning of “ACT Now! For a Warm Winter” 2010 campaign in Delhi and we plan to do much more before the real winter comes. 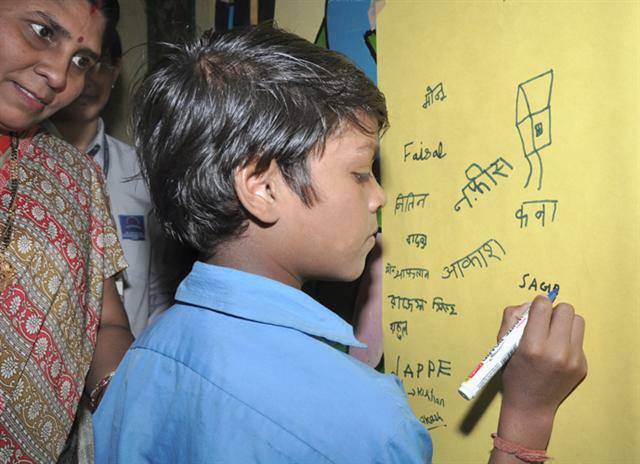 To start with, we have chosen boys’ shelter ‘Prayas’ in the North Delhi –helping those who are trying to restore the lost childhood of neglected, street and working children and marginalized. At the moment, 120 boys from age 6 to 18, are given accommodation, food and schooling here. These are all homeless boys without parents (or parents are beggars on the street) and boys who are saved from being used as a domestic help. During The Commonwealth Games many slums were moved and children from these slums got accommodated in such institutions as well. That morning I woke up in ITC Maurya. My husband was staying there since it was the last day of President Obama’s stay in the hotel and he wanted me to join him since hotel was much closer to Prayas than my house. So, previous evening I had a chance to see President Obama and first lady Michelle Obama. In the morning, the US first couple left and so did I the moment lobby was free. Mr. Dharampal and Gurpreet joined me. So, from a 5-star-lobby which President of the United States has just left, one hour later I found myself in a completely different surrounding and witnessed very bad conditions under which kids live and study. How amazing all the opposites in life are!!! Just before we started our blanket distribution, I felt like sharing something, both with students from Prayas who were there to receive help, as well as with the students from Rosewood Public School who were volunteers distributing the very same help. I welcomed them all on behalf of Ammucare Charitable Trust and shared with them my experience and joy of Seva (service). I told them that when I was 16, due to the political situation in my country, my family was forced to leave the country and overnight, from well situated family we became refugees. During those initial few months, I’ve experienced the benefits of people who were willing to share. I had to overcome pride and be happy for having an opportunity to get whatever was given to me. Therefore, whenever I’m able to give, I’m so happy to do so, remembering that girl who has crossed the way from being a receiver to being a giver. I encouraged all the students to love, help others, serve and share, if not in any other way by through their smiles. After that Bindu lovingly told them about Ammu and Ammucare, and we started the distribution. Each boy was given a blanket and some sweets, since Diwali was few days back and there is no Diwali without sweets. We were so touched with all the affection they showed towards us. Each student has signed the wall of gratitude, they made one special big card for us and on top of it they gifted us jute folders which they make in their center. I’m sure that photos will say much more than words. As I said, this is just a beginning of our winter campaign. We continue on Sunday, 14th of November. All of you who would like to join us and experience the joy of giving are most welcome to do so. I can’t finish this report without thanking all those who have supported our initiative. Bindu, what to say – you are the best! From checking out the venues, to negotiating with vendors, you’ve done it all. The Amazing Bindu - pure joy! 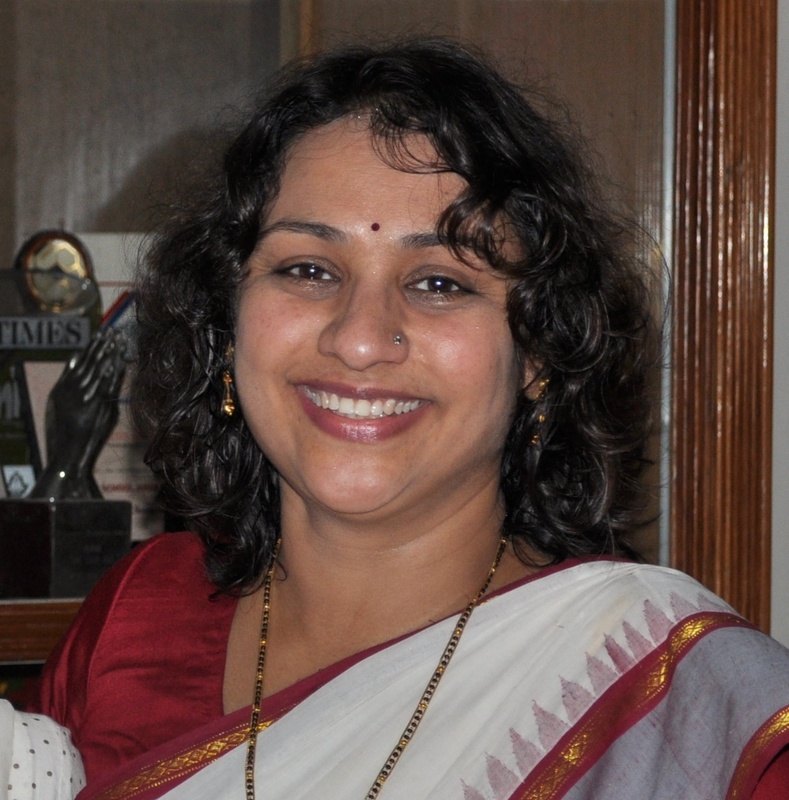 Rajeshwari and the entire Mumbai team have supported us with their donations and so much love. Shaju, Mr. Tikku, Rajeev, Navin, Roma, Sunita, all the volunteers already mentioned, I thank you all on the behalf of Ammucare. All this would have never been possible without all of you. Special thanks goes to Mr. P. K. Namboodiri, President of Ammucare India, for all his coordination, advices and leadership. Grateful to Mohanji and all the Masters for their guidance and the blessing of being on this path, I wish all of us a Very Happy Ammucare Day and hope to hear about ACT initiatives from all over the world. The annual Blanket Distribution of Ammucare Charitable Trust started in the most unusual way this year… Here is a most beautiful testimonial of our dear Sumit, who came all the way from Jammu (Kashmir) to meet Mohanji during last months’s Mumbai meditation – the purity with which he spoke on microphone after the meditation, during experience sharing, brought tears to many. 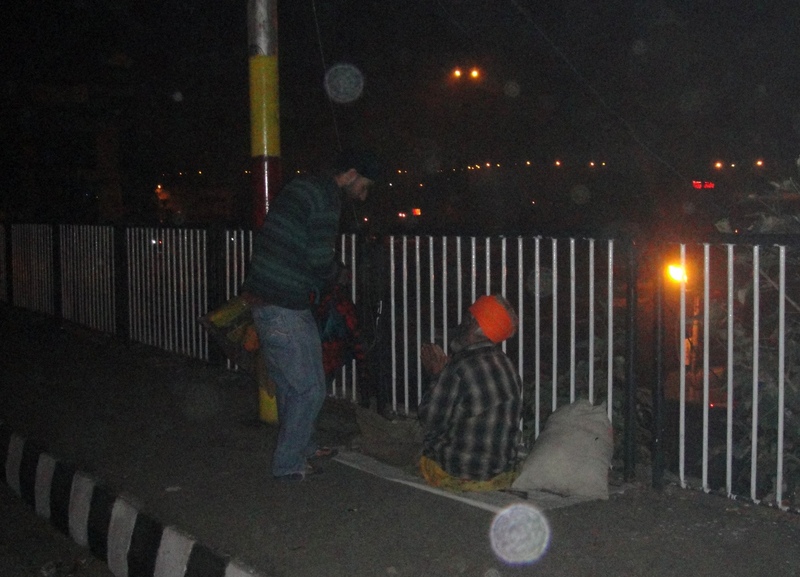 And I had tears welling in my eyes as I went through the following write up and saw the most amazing images from the Blanket Distribution in Jammu, which was conducted in a truly unique way… It is a great joy and great blessings that we all get to join forces and serve… Please read on. The following 3 Thursdays made the message absolutely clear “FEED all, SERVE all, LOVE all.” But at the same time I was just listening and not implementing anything. In the meanwhile, my friend Smriti told me about BTW in Gurgaon and asked me to check the mohanji.org website. I read the whole blog of MOHANJI and was in disbelief after seeing the GRACE of DIVINE on the MASTER. That was followed by a conversation with Abhishek in which he clearly told me about MOHANji’s message “Serve, Feed, Love all the living beings”. I was shocked and at the same time felt blessed that the message I was receiving from Sai Baba was validated and there was a strong connection between Sai Baba and Mohanji. The very next Thursday we started the routine of feeding poor people and labour class people (helpers on the construction site, painters, carpenters etc) with some nutritious food. First Thursday we could cover 300 people and now 600 to 800 people are served every Thursday through us by the Divine Mother. After one and a half month of this routine, I generally used to open the site of Mohanji every day and in my mind used to tell HIM that February is too far and I want to meet him earlier – and soon came to know that he will be coming to Mumbai to conduct a meditation. I strongly feel that it was only through the blessings of the people I served that I could meet Mohanji in Mumbai so unexpectedly. Mohanji fed my hunger in Mumbai by giving me what I desperately wanted, my hunger was to establish myself on the right path that I was searching for. I was fed because through me Divine fed so many people. I bow to the MASTERS for showing me the right path and for LOVING me always. I am humbled. After meeting Mohanji in Mumbai, when I experienced the depth of his Unconditional Love, the question started in my mind “How I can be of some use to the MASTER and HIS purpose.” The answer was simple that for serving people you don’t have to wait, just take initiative and allow the DIVINE to operate through you. 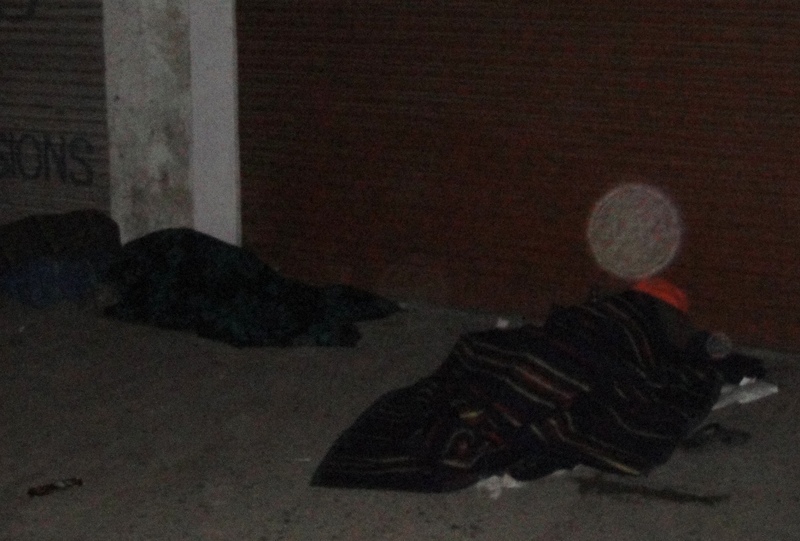 The very first day in the morning when we went for the Blanket Distribution around 5:30 am, a person was lying on the footpath and he had covered himself with a very old cloth. When our team member (Ravinder Singh) put a blanket on him, he was shocked BIG TIME (perhaps he thought we had come to pick him up). But he started smiling when we just covered him with a warm blanket and got into the car – that smile gave us immense joy and bliss. Throughout this distribution we were listening to Sai Baba’s Aarti and felt Mohanji’s presence. It was amazing. After two days we went in the night because we were not comfortable with the idea of any publicity, just wanted to serve. The very first place was a passenger shed where three people were sleeping – we took out the blanket from the car and kept it on them. 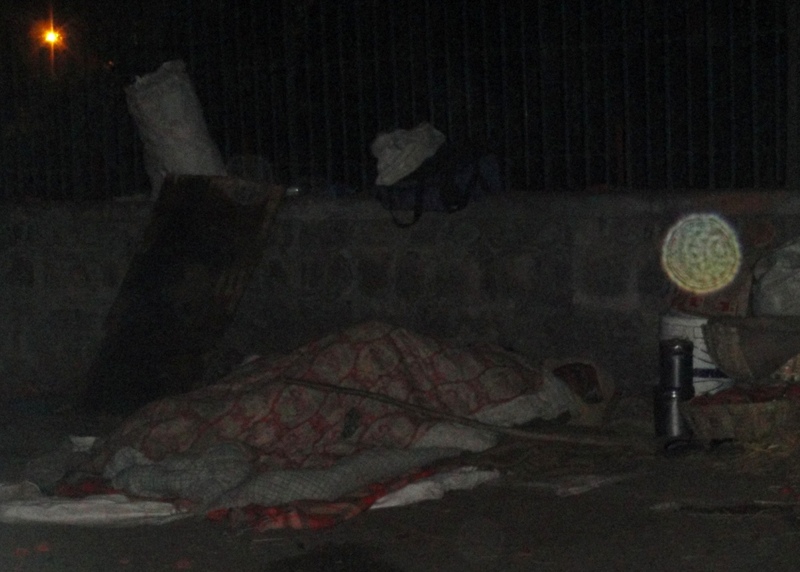 One of them told us while we were leaving that few minutes back they were discussing about the cold and the need of the blanket. This incident gave us such a kick that we left our homes at 11:30 pm and came back around 1:30 am. On Diwali Night we again planned for the distribution, this time we clicked the pictures as well. This Diwali has been the best Diwali of our lives. 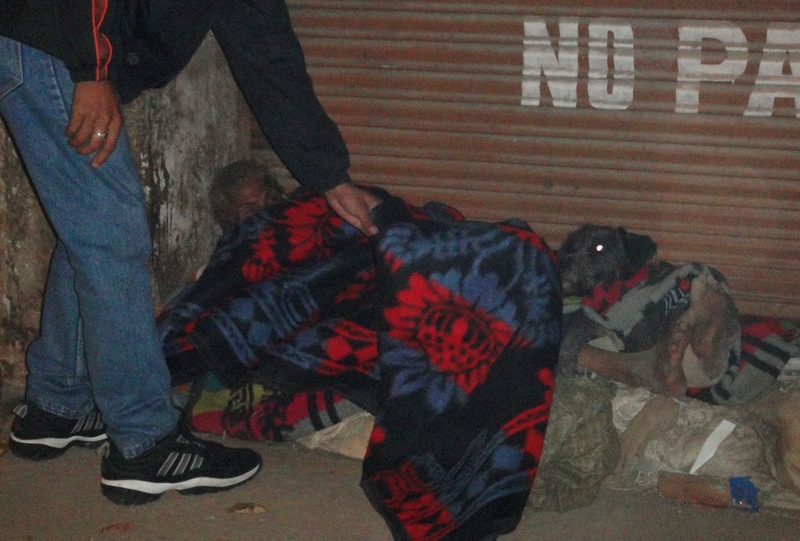 One incident that shook us all was: a poor person lying outside a shop sharing his blanket with a dog. I am speechless, we are contributing nothing – imagine a person without any shelter on his head giving shelter to an animal and we people with all the resources and comforts living selfishly. We have planned it for tonight also to give our tribute to AMMU and to MOHANji for seeing HIS AMMU in all of us and loving all of us as unconditionally as HE loved HER. You Are Not Alone... Presence of the "great orb"
I feel such great, great joy to see how our beloved Baba is connecting us with people who choose to serve as His instruments, who choose to live love, express love, instead of merely talking about the philosophical concepts of spirituality. Indeed, “Hands that serve are holier than lips that preach” – unless we really start expressing that immense love, no big change happens in our subtle system – and our potential is so unimaginably great…. Dr. Deepali: My Dear Friends, what you are going to read now is not my story; but it is about the grace of Mohanji. It is about what I have understood of Mohanji so far. It is definitely something beyond logical mind. Mohanji – those who hear beyond the words, hear me truly…. I am a Medical Doctor, yet, this is beyond any comprehensible science. Actually, I am yet to comprehend all that has happened during this magical trip! My family and I live in Oman. Myself and my daughter Moushami travelled with Mohanji during his recent visit to Mumbai, and came back to Oman with him on Oct 23rd. As you have already read in “Mohanji and the Mumbai Grace” blog, our gathering in Mumbai was exactly like a family reunion. Friday, October 22nd, was my birthday. The highlight of this year’s birthday was the trip to Bade Baba’s abode in Ganeshpuri, along with Mohanji. Almost all the BTW family members who gathered in Thane accompanied Mohanji for his visit to Ganeshpuri. Since the previous evening’s meditation at Thane, we slept very late and all of us must have had only an hour sleep before we started for Ganeshpuri, at 4am. However, nobody was tired or sleepy. There was an amazingly powerful energy keeping us warm and energetic. Time must be followed. Early morning, beginning of winter, some fog, small mountainous, bumpy roads with thick greenery around – nothing mattered. Nothing bothered anyone. It was a beautiful drive! Mohanji Welcomed With a Garland! 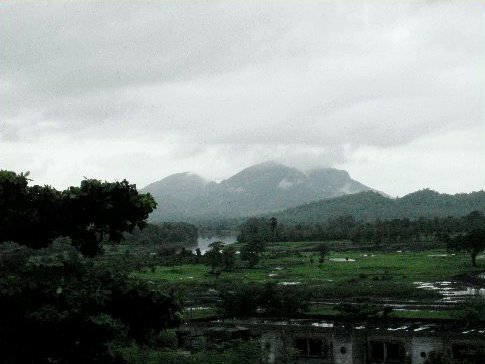 Ganeshpuri is situated at the feet of majestic Mandakini Mountains in Maharashtra. It is the place of Bhagawan Nityananda, the Great Siddha Master who stayed and also took Samadhi here. He is lovingly known as Bade Baba. We were visiting our tradition. Even though our aim was to participate in the Guru Gita chants at Muktananda Samadhi before we had darshan at Nithyananda Samadhi, the vehicle passed by the Muktananda Samadhi and automatically arrived at Nithyananda Samadhi. We arrived at Ganeshpuri around 5.30am. Mohanji guided us to the hot spring pool. After washing our feet in the naturally occurring hot spring water, we straight away went to Baba’s temple and place of Samadhi. There were already many people sitting there. Bade Baba’s Namjapa (taking Gods’s name consistently and consciously at least for 108 times) was going on. We all sat quiet. Few minutes later, the Arati started. Beating of drums during Arati was so powerful and it was as if it’s beating our heart chakra (Anahata)! (Marina: “The minute I entered the hall, I felt deeply touched and tears welled up almost immediately. I sat on the floor in front of Nityananda’s golden and with flower garlands covered stature, which felt so alive that I was almost overwhelmed and could hardly breathe and focus my mind. His eyes seemed real and looking around, looking at me. And the whole energy around his stature was vivid, bright and beaming. Just how can I describe with words what I felt in that hall? I melted into a cloud of love and divinity. I could have constantly bowed in respect and surrender. I sat in silence completely gobsmacked and hit by this absolutely unexpected loving force that I was surrounded with. 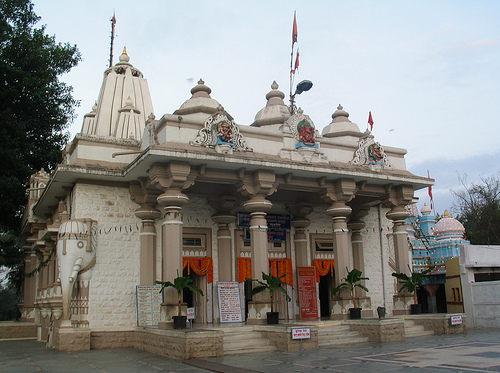 Dr. Deepali: This temple has Baba’s at least 5-7 feet idol in sitting posture installed on a platform. After the Arati, all queued up to pay reverence to the marble feet of Baba installed in front of the Samadhi. Nobody is allowed to enter the Samadhi or touch the idol. All were allowed to enter only the secured area for Darshan, touch the marble feet in front of the Baba idol, pray and move on. As a routine, we went, had Darshan, took Prasad and came out. Mohanji also stood in the queue and moved with it as normal. But , amongst so many people who were queuing up in the temple, when Mohanji approached, he was welcomed by the priests with a garland of fresh flowers! How did the Priest got to know about Mohanji? How did he recognize him? It is 100% sure that they do not know each other in this life. I still do not know the answers. Thus Bade Baba received Mohanji in His shrine with so much love, affection and appreciation. When Mohanji came out, he gave the garland to me and said “Happy Birthday”. You can imagine my happiness! This event itself is self-explanatory of Mohanji’s stature. Another thing that struck me was, even though we never informed anyone in Ganeshpuri about our visit on 22nd, unknown people just came forward and escorted us and made us feel comfortable. They were not doing this for money. Something was pulling them to Mohanji. We all felt that we have arrived at Mohanji’s abode, our abode too. Kailas Nivas We went to Kailas Nivas where Bade Baba’s stayed. Its hall has Bade Baba’s big photo gallery. Mohanji carefully took us through all photos. But, later we realized that we had not really “understood” bade Baba’s photos, as much as we should have! We did not “see” them properly. We did not actually catch the deep subtlety and profound inner meanings of seemingly simple actions of Mohanji and were unfortunately stuck with the gross. We visited the place where Bade Baba regularly met his devotees. We bowed down to his chair which had typical two cushioned resting arms. That whole area was full of vibrations. Mohanji was quietly walking through all rooms where Bade Baba had his stay. It felt, as if Mohanji was re-experiencing or reliving his past! In a way, we were too. It was indeed home coming! The caretaker of this place, looking at Mohanji, said with reverence: “Come, I will take you to a special room where Bade Baba would rest.” This place is not open for all. But we all had great fortune to experience this room full of energy because of Mohanji. This is now air conditioned and maintained very well. The same care taker gave all of us the holy water, secured after abhishek, and also directed Mohanji to another building where Bade Baba took His Maha Samadhi. It is called ‘Banglorewala building’! We were surprised at this direction. Again, the same watchman who was in the Samadhi place, came with us and took us there and showed us each important places connected with Bade Baba. Once again, he came out of love and not for money! We went upstairs in the room where Bade Baba took Samadhi on 8th August 1961. This room was different, fully charged. The place, the bed where he left his body, has been converted into a small temple. 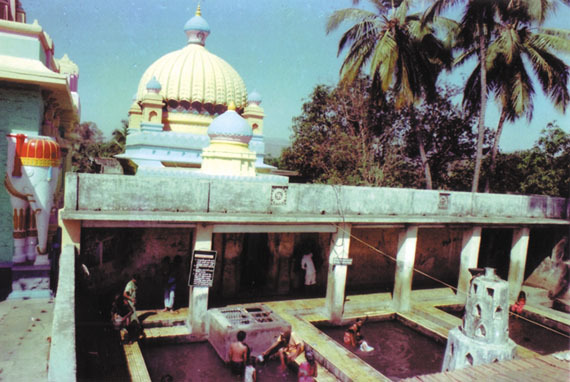 Mohanji offered his deep reverence to Bade Baba at this place. He stood there for some time, silently communing with Baba. We all followed him. It deeply touched all of us. Sudeep cried like a small baby there. 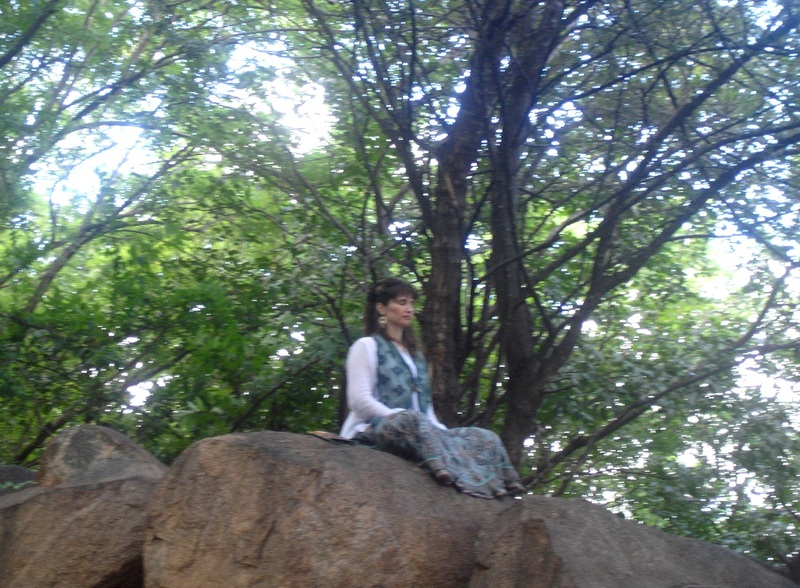 In that strong energy field with Mohanji’s highly expanded presence, we all must have undergone deep cleansing. Something surely happened to all of us; even though we are too gross to assimilate the subtle changes that happened to us and articulate it. (Sudeep: “We were shown the bed where Bhagwan actually took Samadhi. The moment I bowed and my forehead touched that bed, some very strong energy touched me. I had deep tingling all over my body and went into a trance-like state, with no thoughts at all for a long time. I kept on gazing at the third eye of Bade Baba. Then, suddenly, I felt deep merging into Him as if He walked into me. I melted completely and tears were flooding my eyes. For a moment, I touched my soul and clearly experienced its subtlety. My whole heart region was in an expanded state and for some moments I felt my body did not exist. Then we all sat for some time in this energy field in deep meditation.”) Dr. Deepali: Mohanji was very intense, but silent, as if experiencing his own transition, Maha Samadhi. Something great must have been happening within him. He was directing us by signs. He never spoke a word in that room! I personally could feel his expansion and flow of energy. Marina could see the bursting energy similar to volcanic eruptions happening in him. We all were so busy with our experiences that, we hardly understood or carefully noticed the changes within him. He was silent… This hall had Indian style of seating arrangement with cushions on the floor, supported by the wall. Mohanji went and quietly sat on the cushion right in front of the temple, facing it. He closed his eyes. One by one, all of us selected our places and sat. The energy during his quietness was profound. I personally was confused whether I slept or was in deep meditation. Everyone one of us looked quiet and speechless but at the same time charming and glowing. The whole effect was extremely subtle and hence beyond our comprehension. Mohanji only can explain what was happening; knowing him, he will not! 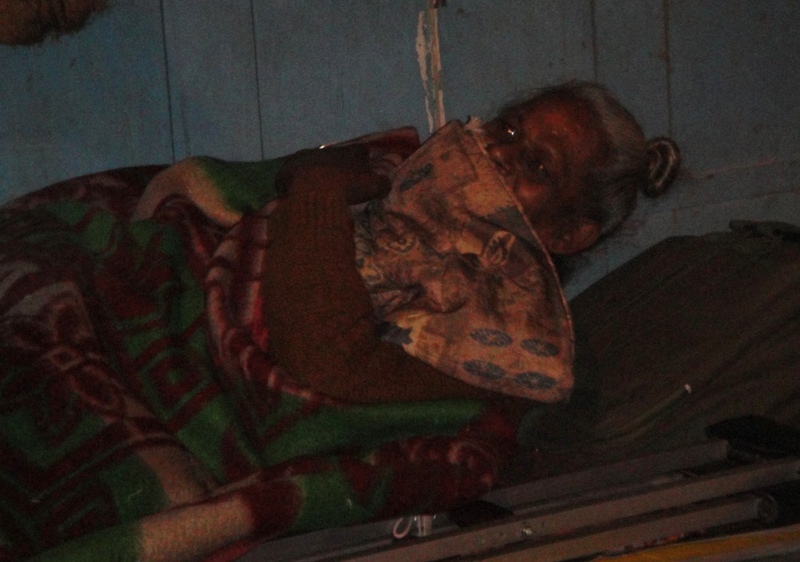 After sometime, Mohanji stood up and we silently came out of the room. Vajreshwari temple We went to Samadhi place of Baba Muktananda, the direct disciple of Bade Baba. It is usually closed after the morning prayers. We were told that, 22nd Oct being special – the date when Muktananda took His Maha Samadhi, this day His Samadhi place will be open after all, from 10 – 11AM!!! Now, after experience in Haridwar and Rishikesh, I am no more surprised with the fact that, things are just organized for Mohanji’s visit. Everything just opens up and happens. Mohanji visiting any place is only as per a divine plan which just does not fail. He never plans his visit. He does not call anyone prior to his visit! But nothing appears out of place. Everything happens as if well-planned! All we did for this trip was to book the vehicles to transport us to Ganeshpuri. Nothing else. We felt so privileged to be walking with Mohanji. This Ganeshpuri trip again and again reaffirmed this fact and the unmistakable phenomenon. Deciding to come back to the Samadhi of Baba Muktananda at 10am, Mohanji said: “Let us now go to Vajreshwari temple”. This 22nd Oct also happened to be the day of Lakshmi Pooja for Bengalese. Sudeep was very happy to visit this temple. This temple is situated on the mountain/hillock and one needs to climb a lot of steps to reach there. On the way, as Mohanji suggested, we bought fresh pink lotuses. 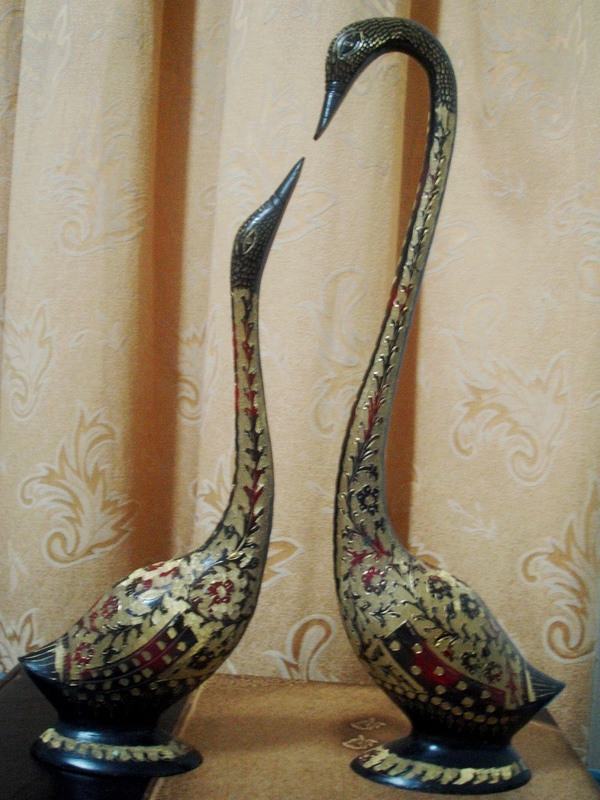 When I paid money for all lotuses, Marina came and gave me Rs.50. I refused to take money, when she insisted and said, “Keep it. Use it for the next time.” I reluctantly kept that 50 Rs note in my wallet. Marina has travelled all the way from Germany to be with us, and I did not find it right to accept money from her. Readers, reference of this Rs.50 is coming ahead! Each of us had one flower in hand. In sanctum, Mohanji offered the lotus to the Goddess first and all of us offered our flowers to the Divine mother. The priest was surprised to see so many lotuses at one time for Devi Ma. Mohanji later said, “Vajreshwari Devi is very happy with lotuses. She sits on lotus. We offered the sitting place to her. Today is also Lakshmi Pooja”. Indeed it was a Divine Blessing. What else could we ask for? We went around the temple. 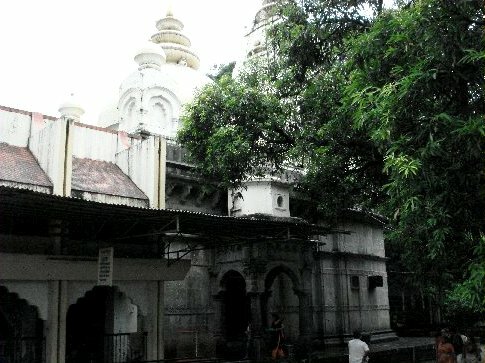 Lord Dattatraya’s temple is behind the Vajreshwari temple. This temple has a beautiful Audumbar tree going through it. Lord Dattatraya’s idol is in front of the trunk of the tree. Mohanji entered the temple and was in a deep communion with the Lord. Moushami and myself followed. Naughty Moushami rang the temple bell. Because it did not ring well, she again rang hard. 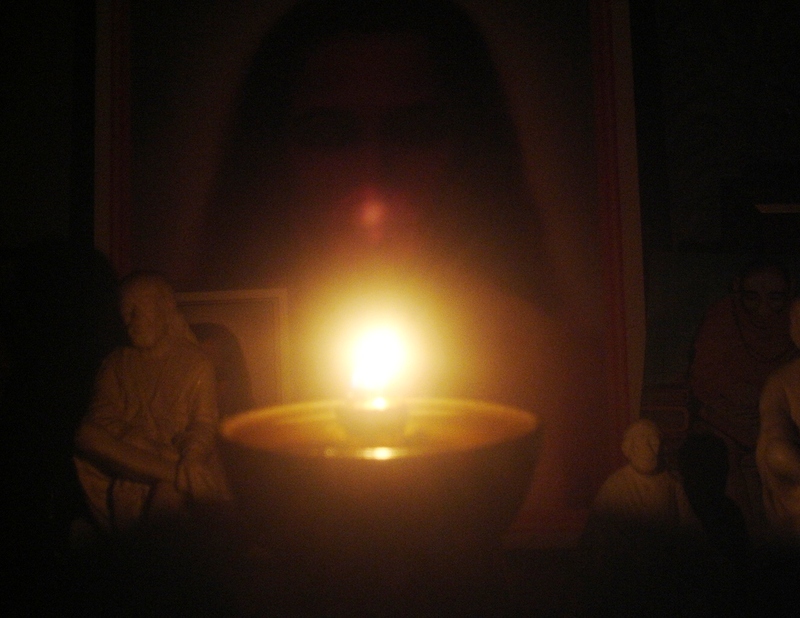 That loud sound disturbed Mohanji’s communion with the Lord and he looked behind. His eyes were red. Fire was expressed through his eyes, but amazingly enough, his face was calm and expressed deep silence. That was enough signal for Moushami to understand what she did. Marina, Rajeshwari, Sudeep and all soon joined. While he was in communion, a deep silence fell in the Lord Dattatraya’s temple. Automatically, we also became thoughtless in that strong energy field. The Photo Shop By this time it was 8.30am. We were all hungry and thought of having a breakfast. We thus went back to the place near Bade Baba’s temple. All of us were also interested in buying Bade Baba’s photos. We somehow naturally walked , i.e. were guided, towards a shop in front of Kailas Nivas. We had seen a photo of a child in Bade Baba’s hand. He is a big man now. This shop belonged to him! We bought some pictures and idols. While talking with him, I asked him for a good place to have tea and breakfast. He promptly asked his son to lead us to the canteen run by the Bade Baba Sansthan. It is called ‘Annapurna’. Soon all of us walked to this place. Bade Baba’s Physical Manifestation: An unforgettable Moment The cook Jaganath, from the place in Thane where Rajeshwari had arranged our accommodation, had packed some sandwiches for our breakfast. We also ordered for some vada-sambar and tea from this canteen. Annapurna is a semi-open place, “L” shaped. We sat outside near the entrance. The entrance had an iron sliding door. Typical tables and chairs of that place were simple, but welcoming and had some familiarity and affection. 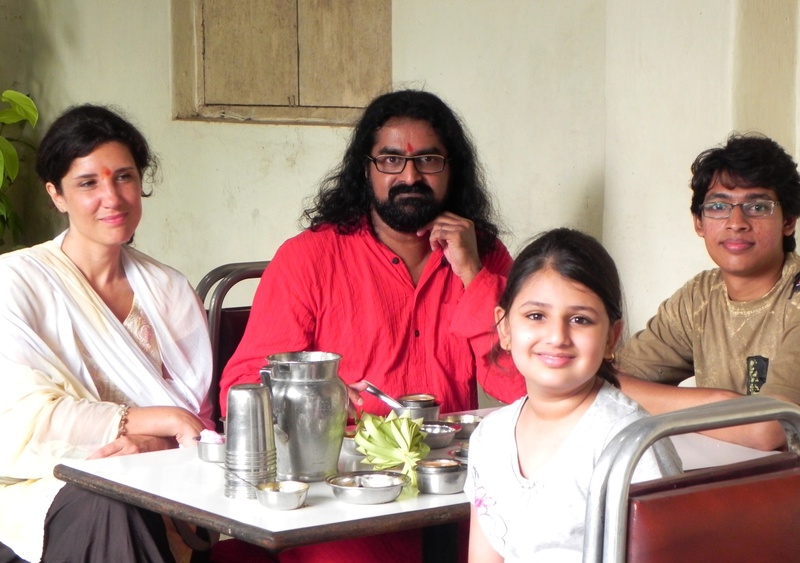 At a table diagonally opposite the entrance sat Mohanji, Marina, Mohanish and myself. 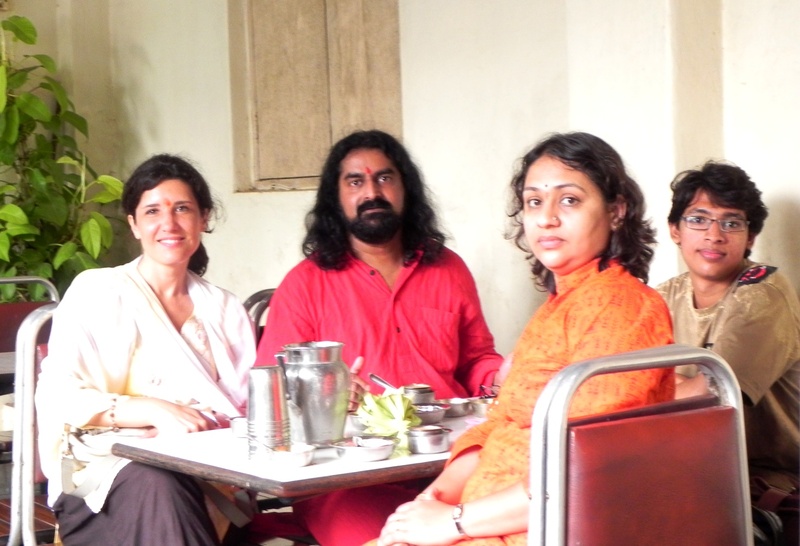 The table towards our left was occupied by Sudeep, Moushami and Rajeshwari. Our three car drivers sat on the table right opposite the entrance. We were relishing sandwiches and vada, serving and sharing with each other and talking to each other. Suddenly, Mohanji looking at the entrance and gave very affectionate and familiar smile to somebody, as if he was expecting him as well, and as if he was happy to meet him after a long time. He had an amazingly beautiful twinkle in his eyes. The energy in that smile was so unmistakable that all of us, in one military stroke, turned our heads towards the entrance to see whom he was smiling at…….. We saw an old man with a thin stick in his hand standing, leaning on the iron sliding door. He was fair, round faced and had extremely beautiful charm and smile on his face. He wore a white colored cloth, a saffron shawl, and had a saffron colored sack on his right shoulder. He had a stick in his hand which had some kind of a saffron flag. He looked like a wandering monk. Suddenly Mohanji said, “Deepali, give him some food.” And when I got up, he said “And some money too.” This was an unmistakably direct and powerful command. I immediately got up, picked the sandwich box and my purse, and went to this monk. There were only two sandwiches in the casserole. I offered him both. The monk carefully held both sandwiches and looked at them from all sides, with great amusement and curiosity, as if he is seeing a sandwich for the first time ever. He spoke in clear and beautiful Hindi and asked, “Ye kya hai” (What is this?). I humbly, with a smile, answered, “Ise sandwich kahate hai. Ye bread hai. Aloo, chutney and tomato bread ke bichme rakhke ise banaya hai. Ye bahot tasty hai. Aap khaiye. Aapko ye bahot accha lagea. (This is called sandwich. This is bread and some tomato, boiled potato and chutney is kept between two slices. It is very delicious. You eat and you will like it. )” He seemed to be satisfied with my explanation and accepted the sandwiches. Meanwhile he was looking up and saying something illegible, as if communing with unseen entities. Then, like a stupid person, I asked him, “Aapko paise bhi chahiye? (Do you also want money?”). He muffled, “han” (yes). I opened my purse and immediately a thought came to give him 50Rs. What came to my hand was Marina’s 50Rs note. I gave him 50Rs. The monk was happy to receive money and replied in a low volume, soft voice: “Bahut dino ke baad kisi ne suni hai. Bahot dino ke baad kisi ne pahechana hai.!!! (After long time someone has heard me, someone has recognized me)”!!!! He blessed us and turned to leave. I politely bowed down to him and returned to my seat. Mohanji asked me, “How was that?” I simply answered, “It was similar experience to what happened at Lahiri Mahashaya’s Samadhi in Haridwar. (For those who have not read, this incidence is given in the previous blog ‘Divine journey-Part 2). With a smile, Mohanji asked: “Don’t you think this smile was familiar?” We were puzzled.… Poor Mohanji, he had to explain further to force the thought into our dumb minds! He said: “Was this smile similar to Bade Baba’s smile? !” And then like a shock, Marina, myself, Mohanish, Moushami and Sudeep and all were just stunned. Our minds opened ultimately! Mohanji said: “Go and take pictures. You will not get this smile again.” This conversation between Mohanji and us must have taken 10 secs. The entrance was just 3 steps away from our table. Mohanish, Moushami and I raced to the entrance with camera. But we could not find that monk and the divine smile anywhere outside or in the neighborhood! Where did he go within 12-15 seconds? Where did he disappear? An old man usually cannot walk so fast and away from us within such a short span of time. We searched everywhere but could not find him!!!. We were beautifully kept engaged talking to Mohanji by Bade Baba and Mohanji! A divine collaboration indeed!!! We came back to the table helplessly. We realized too late that the monk was Bade Baba himself!! And just to complete this miracle and make us aware of this incident deeply, Mohanji asked us to click photos of the visitor!!! If we had not rushed to take pictures, we would not have fully comprehended this true miracle!!! Mind did not accept. Eyes made us believe!! All others are witnesses. I do not know what they saw when I was offering sandwiches. Our drivers witnessed the communion between Mohanji and Bade Baba. They were also shocked. 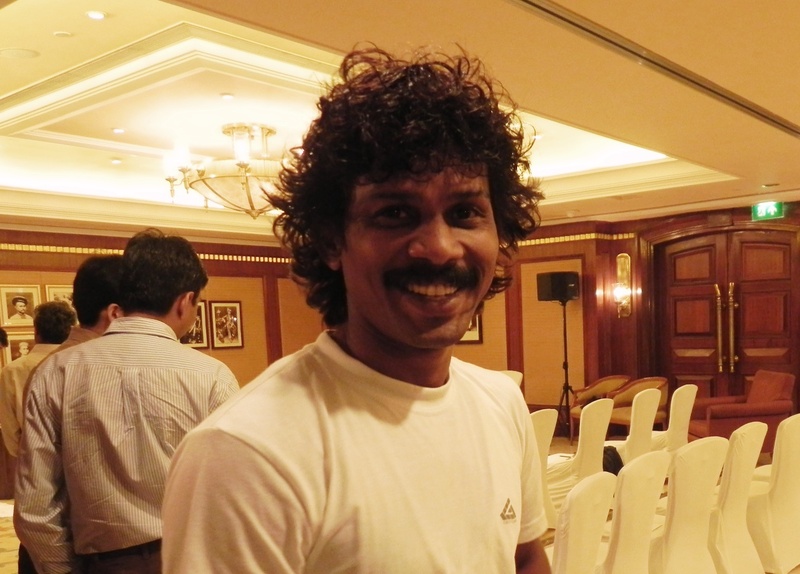 Vinay, one of the drivers, hails from Ganeshpuri. He was deeply touched. A day before this incident, Vinay was fully skeptical and did not attend our meditation. But after this event he was fully convinced and was ready to offer any seva for Mohanji. What a transformation! During the Mumbai meditation, he prostrated at Mohanji’s feet in deep surrender. He continued: “You were shown so many photos of Bade Baba, and still, you could not identify him or his smile!” We all felt ashamed. The truth is that we do not observe properly. We should learn to be fully in the present, taking cue from the past. Presence of mind is the key. Being in NOW is the key. This was a BIG Practical Lesson for all of us!!! Mohanji then sweetly said: “Deepali, what other gift do you want on your birth day? !” How can I express my sincere gratitude towards Mohanji? How much ever I offer, it feels inadequate. We all had physical darshan of Bade Baba only because Mohanji was with us. Later, Marina, Mohanish and Moushami tried to spot the same monk amongst others – but in vain…… We proceeded towards the temple again. By then, all of us had become silent, introverted or peacefully inward. He welcomed all of us with tea. 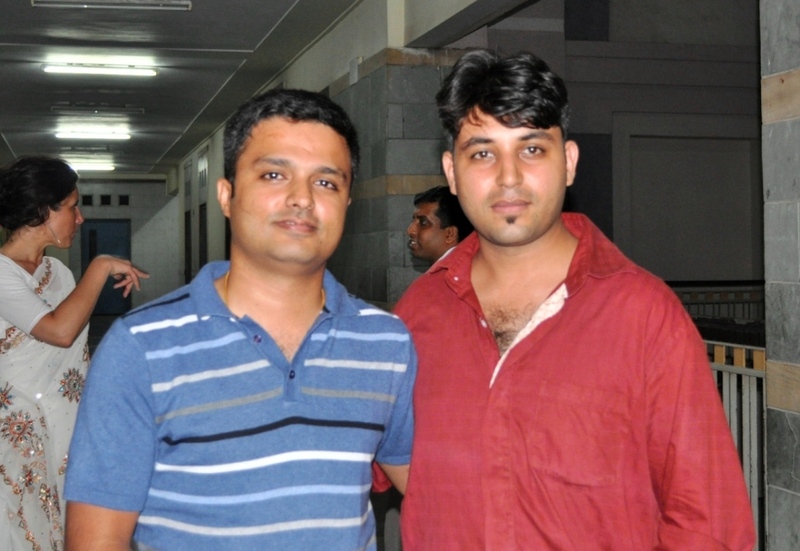 He organized the Paad pooja for us. Mohanji wanted all of us to perform Bade Baba’s Paad Pooja. We all joined him and performed pooja on behalf of us and our family. That priest conducted the pooja extremely well. We all sat in front of Bade Baba’s statue in the Samadhi temple and performed the pooja. The energy was tremendous. Mohanji looked completely different… very powerful. I have seen so many Masters in him till now. But today, he looked exactly like Bade Baba… Similar fingers and big belly!!! His smile had changed. I have witnessed these physical transformations in him many times. As per the rituals, Bade Baba’s feet in silver were worshipped. The silver feet represent his feet. Let me tell you frankly, I always felt those silver feet as Bade Baba’s actual feet. Moreover, at times I felt that, these were Mohanji’s feet! Many of us cried in gratitude during Pooja. 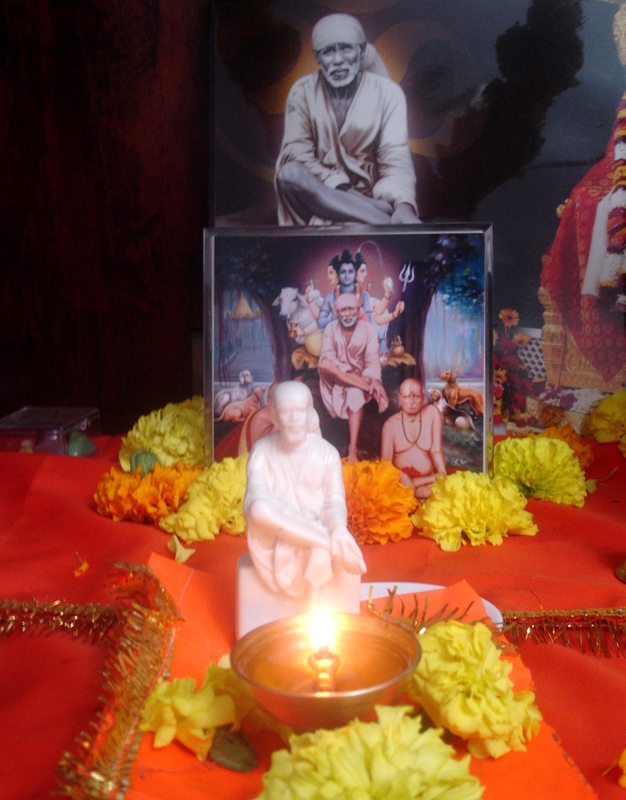 “Throughout the Pooja, I had frequent visions of Bade Baba and a definite assurance that, …. That monk who accepted your offerings was none other than me!!!”. I got this assurance during the pooja. It was a great sight to see Mohanji performing pooja with deepest reverence. I felt that we usually perform pooja at a very superficial level and without any clear understanding, but with many expectations! Offering garland to Bade Baba was to understand Mohanji and the tradition After Paad Pooja, Mohanji asked me to follow him to offer garland to Bade Baba. Out of our group, only Mohanji and one more person (which happened to be me) were allowed to enter the Samadhi place, as it is not open to public. Only priests enter that area. It was a great honor for us to touch and surrender to Bhagawan Nithyananda at His Samadhi. We gratefully went inside the sanctum sanctorum. The idol being very tall, poojari must stand on a stool and hold garland from the front. We go behind the idol and together offer the garland. Mohanji offered the garland first and touched his head/Sahasraara to Bade Baba’s spine. Then he went aside and stood there. I repeated what he did. I blindly follow him and try not to use my intellect. If he says go and do this….. I just go and do it. I do not analyze – this is what I have learnt to be very important. That statue is so tall that, my head would reach only up to Bade Baba’s root of the spine. After offering the garland, when I touched my Sahasrara to Bade Baba’s spine, something most unexpected and powerful happened in my inner space, before my inner vision: Sai Baba appeared. His spine got aligned with Bade Baba’s spine. Then came Mohanji and his spine got aligned with Sai Baba and Bade Baba’s spine. All three spines merged with each other. Soon, my spine came in line with their spine and then I was sucked into their spine. It was such a powerful and great enlightenment experience. I did not exist. So in a space, initially, first there was Sai Baba and then Bade Baba, and then Mohanji. But later all became one and I became one with them. That whole energy entered through my Sahasrara chakra, travelled through my spine, and went back to their spine…. This circular flow of energy happened for some time. This process gave me a big jerk in my spine, with slight pain and a click. My spine became extremely hot and tough. I felt extremely light and liberated. The plane in which I was pulled was so beautiful and serene, only unconditional love existed there. The brightness of that plane was very different than what we call brightness on the Earth. This place was neither Shambhala nor 5th dimension. It was magnificent, fully open and free flowing. There was no beginning or end to this place. It was the most beautiful place. I do not know what to call it, neither would I like to analyze it further. I just know it was theTruth. That place was REAL. That place is the only Truth that could exist. Everything was calm and full of dense, thick positive energy. It was a place from where I did not want to come back!!! This was the first time I understood the meaning of “Gratitude to the Existence”. It was my birthday. What a GIFT on my birthday!!! This was the first time that I realized the importance of this physical body and day on which I came out in this world with this physical body. I experienced the 360 degree vision and I understood the deeper meaning of Mohanji’s 360 degree meditation. I did not want to come out of that state at all, but I had to… When I came back from that place, I realized that my spine has changed. It has become stronger. My emotions had changed. The world appeared different than before. Then, I understood ‘Mohanji’s SPINE’ for the first time. There is a deep meaning when Mohanji says, “…Concentrate on the spine, be with the spine…….” Dear readers, this was a very profound experience. It revealed to me so many things about Mohanji and the tradition……. 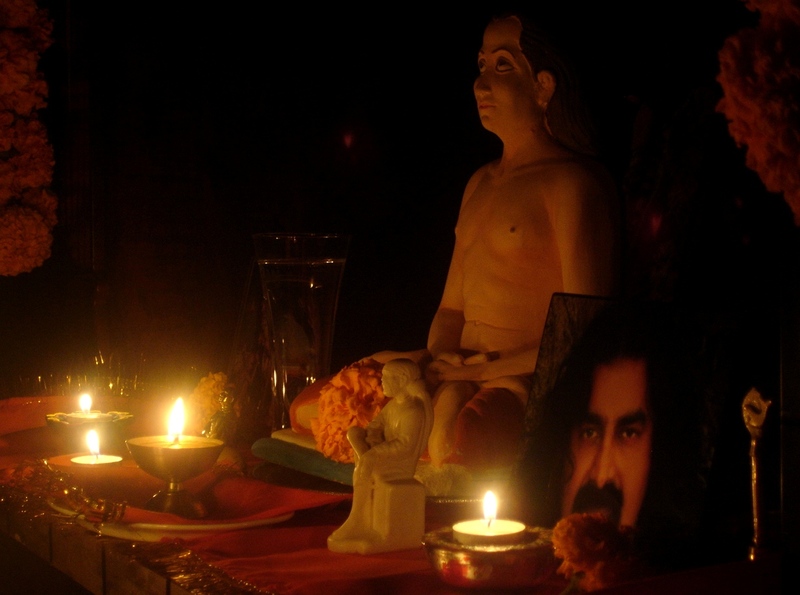 …….. Mohanji belongs to the Siddha Tradition, which includes the traditions of Dattatreya, Kriya Yoga and Siddha Yoga. He is one with all the Masters. Because he is one with the Masters, many of us experience different Masters in Mohanji. We will experience according to our faith. Whether it is Sai Baba or Bade Baba, what difference does it make, as he is one with all of them! He is a Sadguru for me and for us. He will take us through and beyond all these realms and maya. He will take us through all our conditionings and sanskaras. His grace is so essential and vital for our existence. What we need is faith, purity and surrender. Life actually becomes simple with this. I am experiencing it every moment. Our Guru is everything. He is all Gurus. Guru is required. He is extremely essential. What can we achieve without His grace? He offers the lasting support towards our evolution. We alone are not sufficient. Catch on Him. Hold Him. Forget yourself and your intellect. He understands more about you than what you understand about yourself. Just surrender. He is giving us guidelines, and yet we are resistant to accept and implement the same. He has tremendous ability to take all of us with Him. We do not let Him do that! We feel we are smart? We are still caught up as to who speaks through Him – is it Baba, or Babaji, etc… If we cannot comprehend the Guru in a physical form, how and when will we understand and comprehend the Masters who have already left their bodies, and would appear physically like this!! Experiences are unique for everyone. They are unique for every soul. No comparison. There is always a message in the experience. We often do not understand the proper message and get carried away with our preconditioned mind. Our own intellectuality goes against our own evolution. Our physical body is the most beautiful gift from the divine. Without this we cannot experience Him. We abuse our body by either taking unnecessary extra care or negligence. We all have many different concepts of our birthday celebration. Do we offer gratitude with reverence to the existence? Gratitude is the key. It brings unconditional love. It brings acceptance to the situation. While I was undergoing this experience, Mohanji was standing there in the corner. He was just patient and calm- that was oozing out of his face. That poise of firm standing with strong support assured me that He is there forever!! However, I have always noticed his reassuring posture while giving individual Shaktipat, conducting meditations or otherwise. He knew what all is happening with me but never said anything. After this experience, I wanted to sit with him and ask about this, but I remembered….. He had said once: “I never asked my Gurus WHY and HOW.” I kept quiet. I know I have to go beyond this experience. I cannot hold on to the experience either. Visit to Muktananda’s Samadhi We went to Muktananda’s Samadhi place from the temple. The place was well decorated with flowers and well organized so that devotees could visit the Samadhi place. Then we went to Muktananda’s ashram which is opposite the Samadhi place. 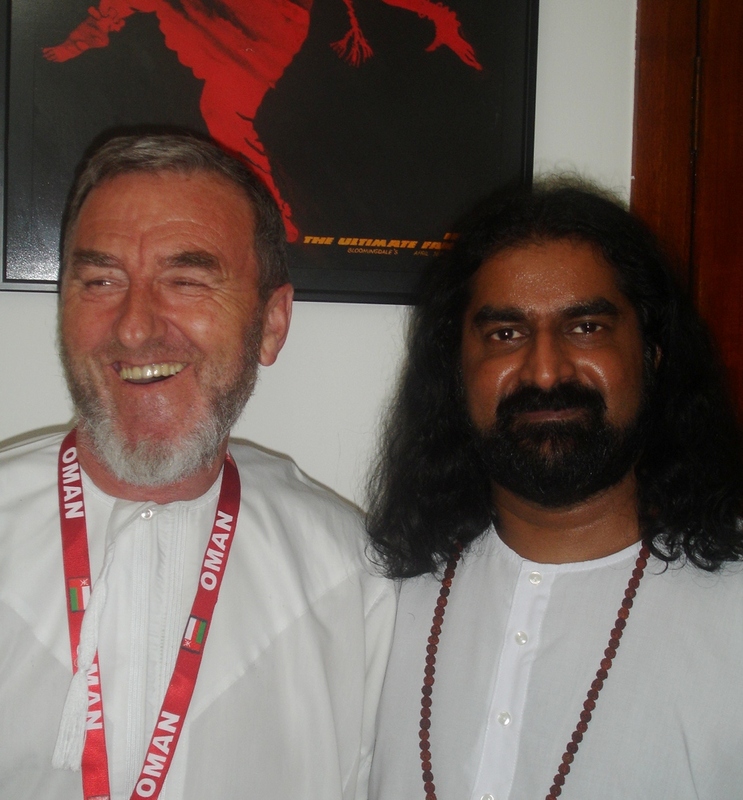 Mohanji wanted to meet his friend Sevananda, disciple of Muktananda, who is also head of the ashram at present. Mohanji had not informed him about his visit, but enquired about him in the office. We were told that Sevanandaji is very busy due to today’s special day. We all waited in the small hall. 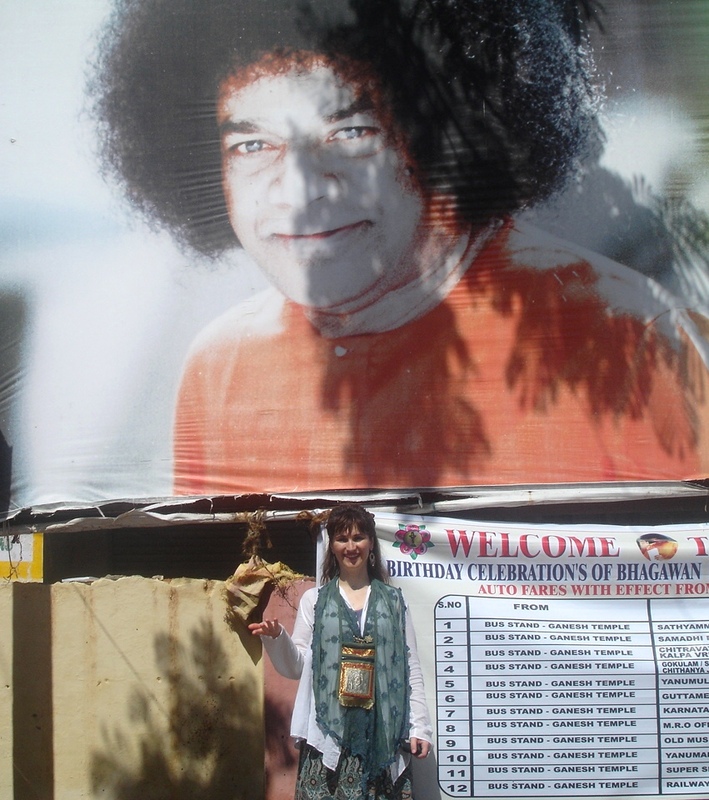 Few minutes later, Rajeshwari noticed some tall fair man wearing saffron….. she thought he could be Sevananda. She alerted Mohanji. And wow…. 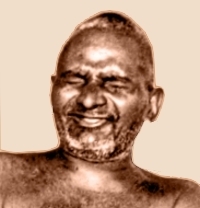 He was indeed Sevananda! From somewhere he got the message that someone is waiting for him at the reception. Seeing Mohanji waiting, Sevananda literally ran to give him a big hug. We enjoyed seeing the meeting of two friends. When intentions are clear and pure, meetings happen effortlessly. 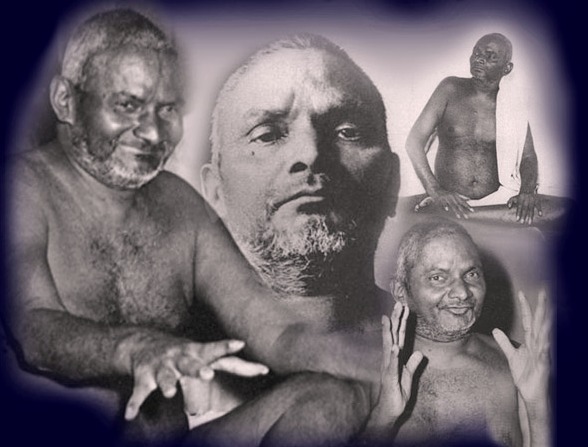 (Marina: We had a lovely chat with Swami Sevananda and at some stage he looked deeply into our eyes and commented: “You all have such shiny eyes!” And he smiled an unforgettable, charming, knowing smile…As far as I am concerned, my heart made another jump in awe when Swami told ust that sage Vashishtha used to walk in the area of Ganeshpuri and performed Yagnas. 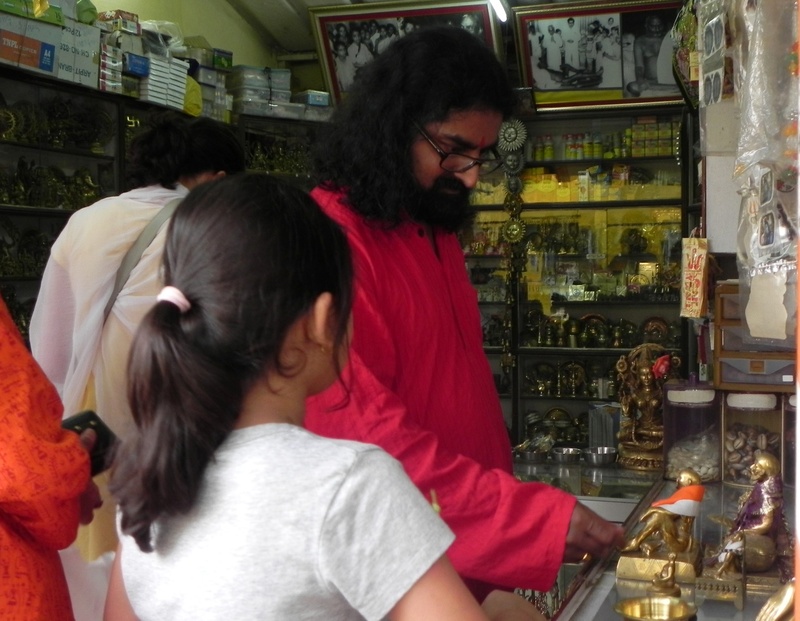 This was the third time Vashishtha was brought to my attention during this Indian pilgrimage of mine….) Dr. Deepali: All in all, these two days, we all witnessed, experienced and enjoyed Mohanji’s energy field. We were not always around him; still we could feel his immense presence. It took away our sleep and appetite. We felt so fulfilled and satisfied. None of us slept for more than 2 hours in those 3 nights. Still we did not look tired. Our eyes and face were fresh. Mohanji, Sudeep, Mohanish, Moushami and myself landed in Muscat at 8am and went straight to our work. Rajeshwari too went to her work on Saturday. None around us could feel that we underwent such a hectic schedule over the last 3 days. This is the magical beauty of Mohanji’s energy field. Be always happy and blissful, radiate that energy, and be always contended. Mohanji, please accept my deep gratitude and complete surrender at your feet for this lovely gift of ‘understanding’ on my birthday.